Back with another preview this one of the Grandaddy of them all. It feels odd that this game is not on today on New Year’s Day. The Basics: Monday, January 2nd from Pasadena California at 5:00 PM EST. The game will be televised on ESPN. Wisconsin (11-2) and Oregon (11-2). History: The Rose Bowl is just oozing with History and probably the bowl game that us Big Ten fans know the most about. It usually pits the winners of the Pac-10 and the Big 10, unless of course either of those teams make the NC game. Probably one of the best Ohio State memories comes from the 1997 Rose Bowl when our Buckeyes defeated Arizona St. and Jake Plummer when Joe Germaine hit David Boston in the corner of the endzone. The Rose bowl started in 1902 and has been played at the Rose Bowl stadium ever since it was built in 1922. Oh, and there’s also the yearly Rose Bowl parade as well that usually takes place on New Years day. Wisconsin: Wisconsin is a team that at one point in the season had hopes of playing in the NC after the off-season transfer of Russell Wilson to Quarterback the Badgers. This was until Michigan State beat them on Hail Mary, which was followed up the following week by Braxton Miller’s back foot throw in the last minute to Devin Smith. Wisconsin was then able to finish out the season, and win the B1G. The Badgers are led by a huge offensive line on offense. They pave the way for Montee Ball who led the Badgers with 1,759 yds and 32 tds. Ball finished the season with 38 total tds which is one short of the FBS record set by Barry Sanders. Russell Wilson also has Nick Toon to throw the ball too, who has turned out to be a very good college receiver. Wisconsin will be looking to avenge last years Rose Bowl lose to TCU. The game will fall on the shoulders of their Offense to be able to put up plenty of points as well as their D to try and slow down the high powered Oregon offense. Wisconsin is not to be outdone by Oregon’s new uniforms (more later) with the unveiling of their new Adidas uniforms for the Rose Bowl game. Oregon: The Ducks also have a big play maker that totes the rock in LaMichael James. He led the country with 149.7 yds / game. They are led on offense by Daron Thomas at QB. Oregon also possesses two more threats out of the backfield with Kenjon Barner and De’Anthony Thomas. Thomas is also the leading receiver for the Ducks. 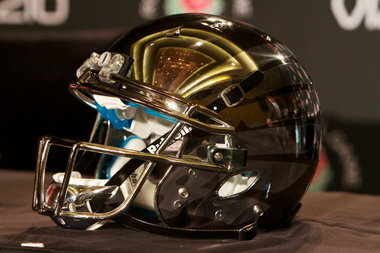 Oregon will also be unveiling new Nike uniforms and a “liquid metal” helmet. More Interesting Than The Game? Oregon will also be trying to avenge losses in BCS bowl games as they have dropped their last 2- Last year in the NC game against Auburn and 2 years ago to our own Buckeyes in the Rose Bowl game. Look for Oregon to really try and go up tempo and put a ton of points on the board; which, to be honest, they should be able to do against a so-so Wisconsin D.
Fun Fact: This game will have 2 of the top 10 Heisman finalists in Ball (4th) and James (10th). The fun fact is Ball was a 3 star #47 RB in the 2009 class and James was a 3 star #40 RB in the country in the 2007 class. Both were very underrated to say the least, and it’s a great reminder about scouting services. None of us have faith in our B1G representative… or maybe we just hate Bielema.